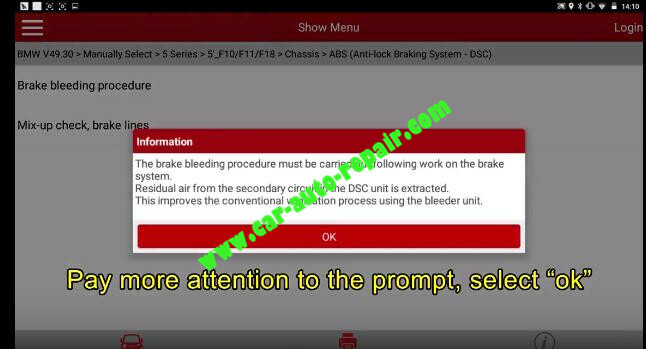 This article show the guide on how to program ABS brake bleeding operation method for BMW F Chassis 2011.More step by step detail operation instruction,pls watch the video guide at end of article.Hope it helps. 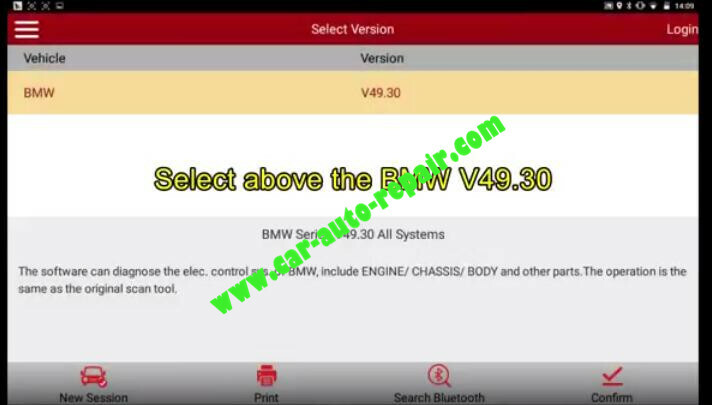 Note:The software can diagnose the elec,control system of BMW,include engine/chassis/body and other parts.The operation is the same as the original scan tool. Then attach bleeder bottle to rear left bleeder valve. The pre-bleeding routine for the rear-axle brake circuit is started in the next test step. For this purpose,a person must sit in the vehicle and press the brake pedal at 3 second intervals. 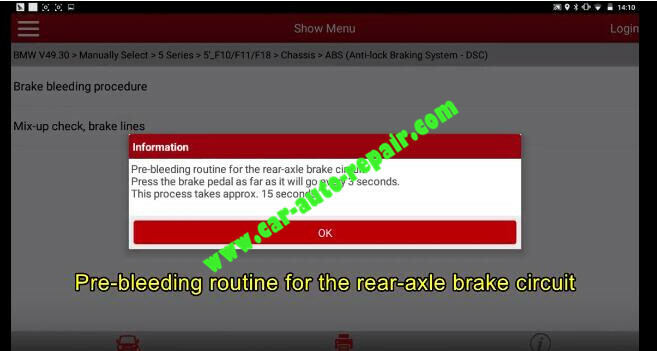 Pre-bleeding routine for the rear-axle brake circuit. Press the brake pedal as far as it will go every 3 seconds. Pre-bleeding routine at rear-axile brake circuit completed successfuly. Rear left bleeder screw remains open. 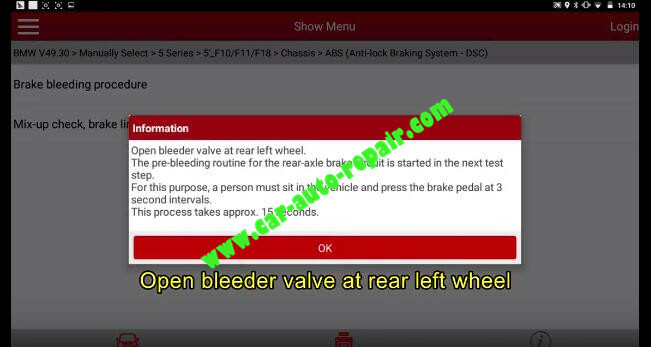 The bleeding routine for the rear left wheel is started in the next test step. During the routine,press the brake pedal as for as it will go every 3 seconds. The routine bake approx. 30 seconds. 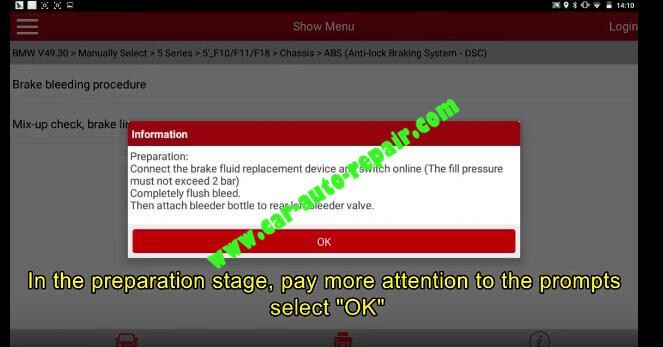 Brake fluid free of bubles must emerge at the end of the routine. Select “OK”,the software show below prompts. Press the brake pedal as for as ti will go every 3 seconds. Bleeding routine at rear left finished successfully. Close rear left-hand bleeder screw once the brake fluid started to emerge without bubbles and foam. Attach bleeder bottle to front left bleeder valve and open front left bleeder screw. 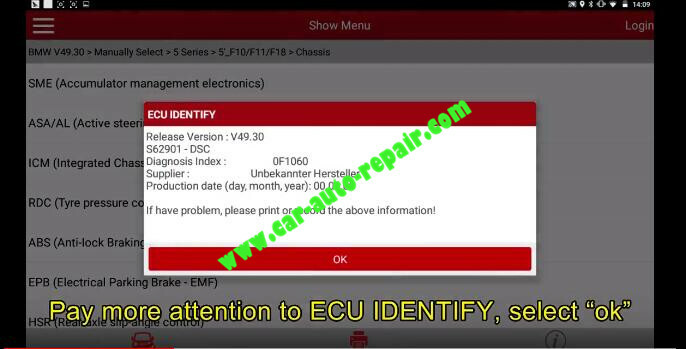 Press [OK] to continue service function. The pre-bleeding routine for the front-axle brake circuit is started in the nex test step. This process take approx. 15 seconds.